So many times we say, ‘If only we could design it ourselves!’ Now it’s your opportunity to put your crafty self into your unique fashion. Choose a favourite First Edition Deco Mache paper design and follow our simple, step by step tutorial. 1.Begin by ensuring the surface one your shoes are both clean and dry. Cover each shoe with a layer of Lace DecoArt Americana Décor Chalky Finish paint. The light colour will allow you to cover the previous design and to make your Deco Mache papers stand out. Once painted, leave to dry. 2.Tear small squares of the First Edition Deco Maché Female Icon paper and begin to apply your squares carefully to your shoes with the First Edition Deco Mache Gloss Adhesive and Varnish. 3.In your First Edition brush set, you will have two brushes. Use the firm hog hair brush to apply the squares of Deco Mache paper to your surface, the firm bristles will help you get a flat finish with your papers. Use the soft, nylon brush to achieve a smooth and varnished look on your shoes. 4.Continue to layer your Deco Mache squares until both shoes are covered, once finished leave to dry. 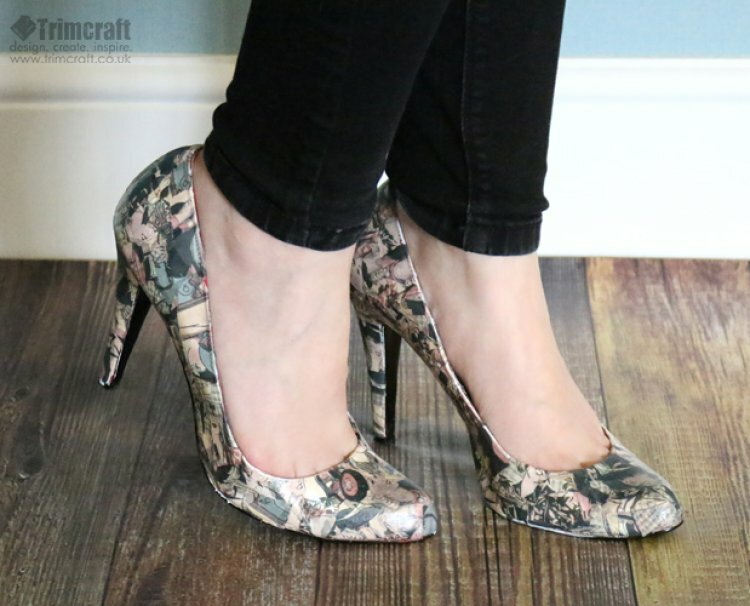 5.We have cut images of the ladies in the paper design out and glued then down whole to add more interest to the front of the shoes. 6.Give your shoes a professional shine by using the First Edition Deco Mache Gloss Adhesive and Varnish. Apply a thin coat on top of both Deco Mache heels and leave to dry. We love the First EditionFemale Icon Deco Mache paper design, they give this pair of heels such a fashionable and on trend feel! Which design will you choose to adorn your shoes? If you’d like to watch a detailed step by step video of how to use the First Edition Deco Mache papers, follow the link to watch Claire use the pretty designs on her decoupage project. Remember to upload your upcycling makes to the inspiration area, and #Trimcraft when uploading on social media we'd love to see your crafts!